Ellie Goulding already has quite a few tattoos to her name, but the pop star really went outside her comfort zone this week, adding an intricate black and white tattoo of a lotus flower to her right ribcage. Ellie’s tattoo was posted online on April 18, 2014, by celebrity tattoo artist Dr. Woo of the infamous Shamrock Social Club tattoo shop in Los Angeles. According to reports, Ellie is enjoying the second weekend of the Coachella festival in California, after giving a killer performance of her own, and the inked-up singer apparently took some time out of her busy schedule to book a tattoo session at Shamrock Social Club to celebrate the event! Ellie’s lotus flower tattoo certainly fits in with some of her other artwork. In November 2013, Ellie commissioned tattoo artist Dr. Woo at the very same Shamrock Social Club to ink a Tibetan mantra on her wrist that translates to “jewel in the lotus.” It makes sense that Ellie would make tattoo number six a lotus flower, which has a strong symbolic meaning, and, according to Buddhist beliefs, is typically associated with enlightenment, fortune and rising above challenges. 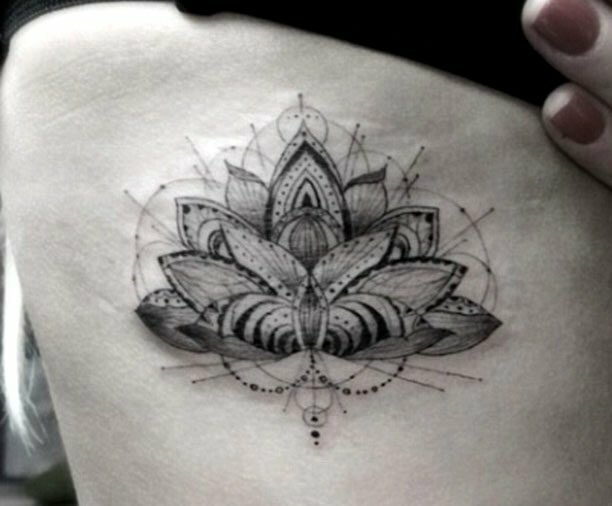 Because the lotus flower grows in muddy waters and rises above the murk towards the light to bloom, many people opt for lotus flower tattoos to represent overcoming a difficult obstacle in life. It’s no secret that Ellie has dealt with some serious challenges in recent years, including breaking up with her boyfriend of 18 months, Greg James, in 2012, after which the singer struggled with feelings of depression. Ellie says the unexpected breakup really “threw her off,” and, even though she started dating singer-songwriter Skrillex shortly thereafter, that relationship only lasted seven months and also ended in a split. During an interview with GQ magazine in October 2012, Ellie revealed that the heartbreak she experienced during that time influenced some of the darker themes in her second album Halcyon, but based on her new lotus flower tattoo, we have a feeling Ellie Goulding is heading for sunlight.